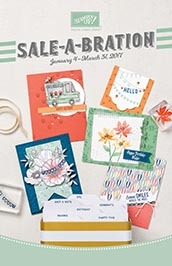 Stampin Up news, Valentine/Birthday card class, and Sale-a-Bration news! Paper Pumpkin special offer -- save $5 when you purchase a 3-month subscription AND receive a free, exclusive sale-a-bration item! Details below -- buy your subscription today! Monthly Stamp Club starts in February. Want to get some hands-on time with the latest Stampin Up stamps and tools? Want to learn new techniques? Have a Stampin Up wish list? Then club is for you! This session runs February to July. Space is limited. Contact me ASAP to learn more! Monday, January 23rd, 7-9pm; make cards (2 each of 2 designs). Theme Love/Valentine (or birthday!). Cost is $10 or free with minimum purchase. 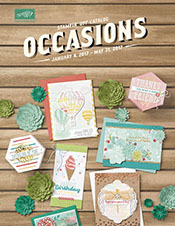 The 2017 Occasions catalog is filled stamps and accessories to assist with birthdays, Valentines, weddings, Mother's Day, Father's Day, and more. And did I mention birthdays? You are going to love it! Host a $250 party and get $25 additional hostess dollars. 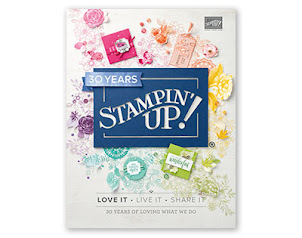 Join my Stampin Up team during SAB, pay $99, choose $125 of Stampin Up products, THEN, you can choose any 2 stamp sets (any price! ), too -- with absolutely no obligation! During Sale-A-Bration buy a 3-month Paper Pumpkin subscription for just $55 (saving $5!) and instantly qualify for a FREE Sale-A-Bration item. The 3-month subscription is discounted to make it even easier super easy for you to qualify for Sale-A-Bration! But wait, there's more! Take it to the next level and surprise yourself every month for a year! With a 12-month prepaid subscription at the everyday awesome price, you’ll save even more! And just like that, you hit the Sale-A-Bration jackpot! Choose me as your Stampin Up demo when you subscribe (or use the link below to automatically select me) and you get a free crafting night every month. Bring your kit to my house and get your pumpkin on! Pumpkin kit night is held at the end of the month, 7-9pm; the upcoming Pumpkin nights are January 30th, February 28th, and March 31st. Click here to subscribe (links to me) and join the fun. But wait, there are more perks for subscribing! Only kit subscribers can purchase kit refills and additional kits (while supplies last). Sign up today!